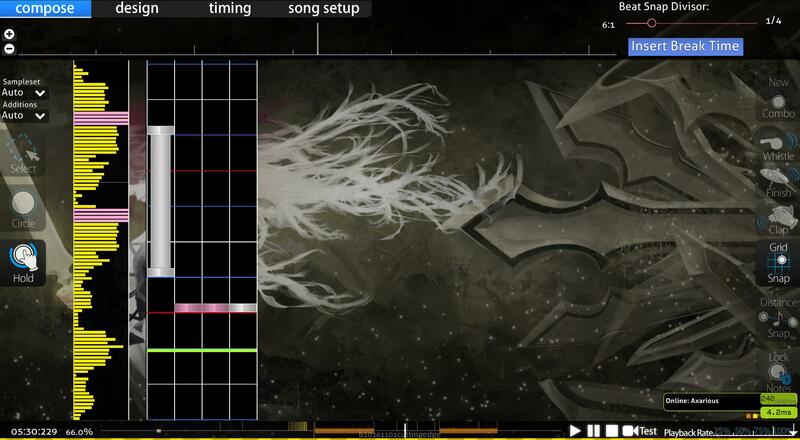 Kurokotei - Scattered Faith [OsuMania] · forums · community | osu! Michelle Rivera for creating this wonderful BG! Last edited by 4hri March 17, 2017 at 2:07:35 AM GMT , edited 230 times in total. 00:27:408 - 01:00:408 - in this section the long LNs should only be 2 beats long. Also the shorter LNs feel really random. After this the map just kind of falls apart. I don't have enough time to mod it all, sorry. You should really spend more time thinking about the patterns and the layering (follow the music more). I'm sure that you can easily find most of the ghost/missing notes by just going through the map with 50% speed a few times. 1) Put more lighter violet. Comment: --> Hmm. I see a very lazy person here, but I guess that can't be help, and you did kindaa mod.... well if it was helpful for ascensionH... then kds.... yea. Anyways, modding time from modding queue. Hi. 00:13:158 (13158|2) - Move to 2, don't want to make it repetitive as previous one. 00:23:470 (23470|3,23470|1) - Ctrl+H then 00:23:658 (23658|2,23658|0) - also Ctrl+H, it makes it sounds better to me. 01:21:220 (81220|3,81220|2,81314|0,81314|1,81408|3,81408|2,81408|0) - I rather Ctrl+H, to avoid 01:21:220 (81220|3,81220|2) getting repetitive with 01:21:033 (81033|3,81033|2). Better flow too. 01:23:939 (83939|3,83939|2) - I suggest these should be remove. 01:30:314 (90314|1,90314|0) - Likely prefer these to be in the middle. 03:03:190 (183190|1) - Wat? maybe put it back in the tick? and im done for the rest of the spam. Last edited by Syadow- November 5, 2016 at 2:53:14 PM GMT , edited 1 times in total. 01:43:908 (103908|1) - till 01:48:408 (108408|1) - maybe a more fitting jack for the original beat? 03:17:923 (197923|3,197923|2) - ghost note? 01:14:731 (74731|1,74825|1,74919|1) - it's not so good here, and I think 2 stacks is enough and music here is not match completely, but 01:16:606 - here is good! 전체적으로 폭타 나오는 부분 빼고는 난이도가 너무 낮아있는것 같습니다. 00:14:356 - ~ 00:14:731 - 피아노 소리에 맞춰서 반복된 패턴으로 하는게 어떨까요? 01:19:794 - ~ 01:40:419 - 베이스 소리에 맞춰서 패턴을 만드는게 어떨까 합니다. 02:58:455 - ~ 02:58:745 - 이쪽은 쉬는 파트 이니까 좀 더 쉽게 만들어주는게 낫을듯 합니다. That's all my mod owo.. Rapidly 잘못쓰셨나요? 그래도 이게 부사라 문법적으로 어색합니다. Supernova Explosion이나 Catastrophic Supernova가 적당할거 같네요. 먼저, Ctrl + Shift + A 를 눌러주시고 노트가 스냅되어 있지 않다는 경고를 다 없애주세요. - 01:40:794 ~ 1:42:247 - 맵이 랭크되기 위해서는 패턴이 규칙적이어야 합니다. 현재 01:40:794 부터 3112112112212... 이렇게 불규칙합니다. - 04:02:791 - 여기 박자가 약간씩 엇나가 있어요 1/6비트로 배치 한 상태에서 조정 부탁드립니다. 다른 부분에도 이런 곳(04:34:430 / 04:55:763 등)이 많네요. 처음부터 끝까지 쭉 보시면서 그런 부분 고쳐주세요. ~ From my M4M Queue ~. - First of all I'm going to make a general comment about pitch relevancy. The intro to this song has the most perfect opportunity to use some effective pr, but instead the notes are mostly placed randomly. For example: 00:03:669 (3669|2,4044|2) - Same column, two completely different pitches? - 00:06:294 (6294|1) - Your pr was great with the note before this, but then this note randomly goes down instead of up. - 00:06:294 (6294|1,7794|0) - Same pitch, different columns? - 00:09:294 (9294|2,9669|2) - Same column, different pitches? I won't point out the rest of it because you get my point. I'm not sure if you're on of those mappers that say 'oh I don't like using pr', but it seems like a missed opportunity here. - 00:15:106 (15106|3,15106|1,15856|1,15856|3,16231|0,16231|1) - I understand you're mapping this to the delayed piano echoes, but the way you're gone about it is a little haphazard. When it play it, it kinds feels like the structure of the song just randomly went to doubles. I think a better choice here could be to either map the echo to a single that shares a column with the double before it, or simply repeat the column placement of the note and echo, so it feels like you're playing it twice. That was it feels more in tune with the song and less like random doubles. - 00:50:544 (50544|1,50637|2) - Any reason why this was split? - 01:07:419 (67419|3,67700|2) - The LN release and the note is a little awkward. Consider moving the note to column |2| instead. - 01:10:044 (70044|3) - Extend this 1/6 further to remain consistent with your releases. - 01:12:294 (72294|0,72481|1) - Why force patterns like this? Maybe consider shortening each LN by 1/6 to that everything lines up a little nicer. The 1/3 gap between each LN is kinda arbitrary anyway as far as I can see. - How come 01:23:075 (83075|0) - is mapped to a note but 01:22:325 - and 01:21:950 - isn't? - 01:47:169 (107169|1,107262|1,107262|0,107356|1) - A little awkward on the left hand. - 02:05:544 (125544|2,125590|1,125637|2,125684|1,125731|2,125778|1,125825|2,125872|1,125919|2,125965|1,126012|2,126059|1,126106|2,126153|1,126200|2,126247|1,126294|2) - I take big issue with this. Why try so hard to force a LN+centred trill when you can just as easily map it to a burst or stair like you did before? This pattern just doesn't fit at all, putting strain on a sound that doesn't need it for what I'm assuming is for the sake of difficulty. - 02:58:455 (178455|2,178455|3,178551|2,178551|3,178648|2,178648|3,178745|3,178745|2,178842|2,178842|3) - A lot of strain for what's meant to be a quiet section. Try move the column placement around to make this more comfortable perhaps. - 03:45:233 (225233|0,225233|1,225349|0) - Kinda breaks the flow of everything here. Having the LN with the start and release mapped to a note on the same hand is just awkward to play. Consider other options. - 05:41:240 (341240|0,341326|0,341412|0,341412|3,341498|3,341583|3) - Nothing in the song seems to warrant those jacks being there. Feels forced. - 07:35:290 - Split the LN here. The melody changes.